Just found out I got in the Santa Cruz Open Studios Art Tour 2016! This will be my second year participating!! Now to start planning……………..
Also I have been asked to donate an item to the Bonny Doon Art & Wine Festival to raise money for the Science and Art programs at the Bonny Doon Elementary School. Donating a 12×12 custom pet portrait gift certificate. Also if your interested in a custom pet portrait, please contact me too!!! I have time right now, since I am finishing up a painting and ready to start another!!! If your looking for greeting/note cards, I have them too in my farm series!! Just go to my ETSY page or select SHOP here on my website!! One Month til Open Studios!!!!! OPEN STUDIOS!!! ONE MONTH FROM TODAY PEOPLE!! For years, the Artist Guide was sold in stores for $20, with about 3,000 folks picking up a copy. This year, we’re changing how we do business and doing everything it can to monumentally expand the fan base for local artists. We’ve joined forces Good Times for the 2015 Tour, and with their help we will distribute 40,000 Guides this year. In late September, 35,000 full-color, glossy, magazine-style Guides will be inserted into the Good Times and will be distributed in Monterey and Santa Clara counties – FREE to anyone who picks up a copy. Cue the towering flames! Hear the roar of the crowd. For fans who miss the September issue of the Good Times, and folks used to the classic system, we’ll have 5,000 Guides available, for just 5 bucks, in outlets throughout September and October. Plus, our Open Studios app has more cowbells, whistles, and functionality than ever. Never to early to post!! So Open Studios is coming up in like under 59 days………….. If you are in Santa Cruz and want to check out the shows! You can get the Artists Guide a bunch of different ways now! Remember my Artist number is #52 in the guide book!!!! Pick up a FREE Guide in the September 30th Good Times. Buy the Guide for $5 at outlets throughout the county starting September 9th. A list of outlets will be available on the Arts Council website. Guides will remain on sale throughout the tour for people who don’t pick up a free copy in Good Times. Download a FREE pdf of the Guide – available on the Arts Council & Good Times’ websites late August. Purchase the $4.99 App for iPhone, iPad, Android phones. App will be available mid-September. 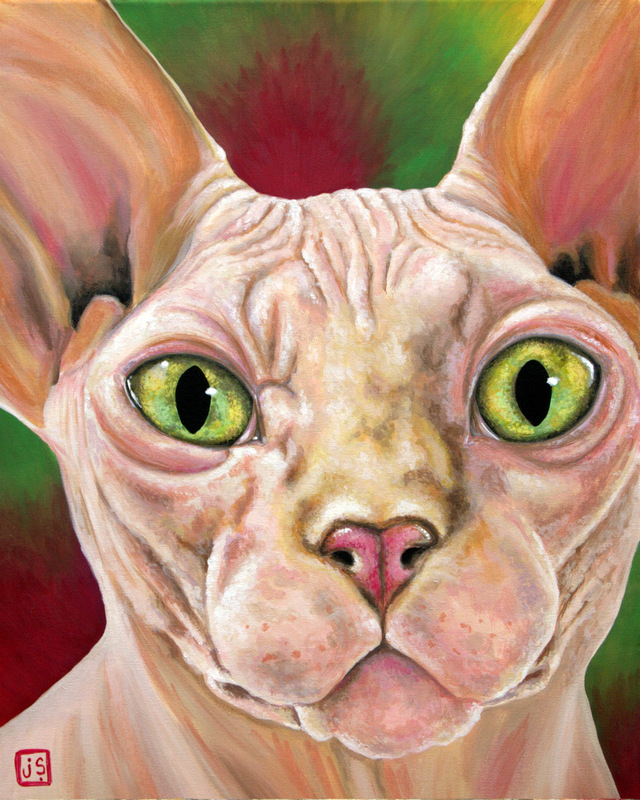 So after many paintings of lovely doggies, I have completed one of a nudie cat! Boris the Sphynx!!! Back on to the birds of prey paintings……………………….